The Focal Dimension offers excellent sound, bass response and imaging, but it requires planning to fit into your home theater setup. If you want truly immersive sound for your home theatre setup, you would usually have to go to a 5.1 or 7.1 speaker system. However, not everyone wants to wire up five speakers and a sub or has the space. Audio companies came up with a solution with the soundbar but, historically speaking, they couldn't keep pace with multi-speaker setups. Focal, most known for its excellent sounding speakers (and the recently released Focal Listen headphones), is late to the soundbar space but its Focal Dimension was worth the wait. The Dimension soundbar is simply gorgeous with its piano black accents and aluminum unibody construction. It's a solid bit of hardware that looks as good as it sounds. The Focal Dimension offers wonderfully balanced sound but limited imaging. Watching Casino Royale, I could hear cars and gunfire swirling around me, but the effect was more like a good stereo speaker setup than true surround sound. 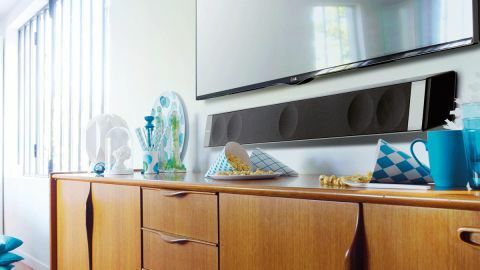 That's not for a lack of trying, though – the Dimension soundbar tries to overcome its inability to pack a 7.1 system into a small form factor by using your living room to simulate surround sound. A good pair of bookshelf or floor standing speakers spaced appropriately apart will offer the same surround sound imaging as the Dimension soundbar, but this type of setup requires more space and hardware, like receiver and amp. The Dimension sounds like a soundbar, there's no getting around it, but at least it's a very good one. Still, if you're looking for a compact audio solution won't be disappointed by the Dimension. Even without the $400 Dimension subwoofer, the Dimension offers great bass response. The soundbar punches way harder than I thought it could from its compact size. However, if you want even deeper bass response and couch-shaking bass, the Dimension sub is an obvious choice. It's built to resist vibration so you can place your TV on top of the sub without worrying about rattles. Combined with the sub, bass digs deep and offers satisfying impact. The biggest drawback of the Focal Dimension system is its design. While pretty to look at, the shape of the Dimension soundbar and subwoofer means you need to plan how the system will fit into your home theater. All of the ports and switches are located in the back of the soundbar, making them impossible to access without flipping the soundbar on its face. The Dimension sub is even trickier to position, as it's made to be placed directly behind the soundbar. Focal includes an short 6-inch subwoofer wire, making installation a pain since the connection terminals are underneath the Dimension sub. Alternatively, you can pair the Focal Dimension soundbar with any subwoofer you like for more flexibility. Soundbars have their limitations, and the Focal Dimension is no different. It's one of the best sounding soundbars I've heard but won't replicate the immersion of a high-end stereo or multi-speaker setup. But for those with limited space, the Dimension soundbar and subwoofer are a great choice. Just plan to set aside an hour or two to hook up and dial in the system. The Focal Dimension soundbar retails for $1,399 (£799, AU$1,699), which isn't cheap but you're paying for excellent build quality, sound and design. The optional Dimension sub is an additional $399 (£329, AU$699) and may be worth it if you want to feel the bass, though I didn't find it necessary for my tastes.